Suite Sports: Do You Care if Your Team Cheats? Do You Care if Your Team Cheats? After an NFL offseason dominated by "DeflateGate" stories, Tom Brady's appeal of his four-game suspension in federal court, and an ESPN report linking the NFL's handling of Brady's alleged wrong doing with New England's "SpyGate" controversy from 2007, we opened the NFL season with (surprise, surprise) more cheating talk! That's right, the Pittsburgh Steelers not only began the season accusing the Patriots of tampering with their coach-to-coach radio communications, they also complained about a tactic New England used when they had the ball down by Patriot the goal line. With coach Mike Tomlin claiming that it's "always the case" that Pittsburgh struggles with radio communications in Gillette Stadium, and quarterback Ben Roethlisberger saying he thought New England's last-second defensive line shift that drew the left side of the Steelers' offensive line into a false start penalty was either against the rules, or an "unwritten rule," we can pretty much assume that any time the Patriots do anything on the edge of the rules this year, we're going to label them "cheaters." For the record, the league exonerated New England of any wrongdoing in regards to "HeadsetGate," and the line shift probably wasn't against the rules. Though the rule is very vague, it generally applies to defensive players simulating a quarterback's snap count, and is rarely called when players make abrupt movements right before the snap. But it's not like this "New England cheats" narrative came out of thin air. The Patriots were caught taping signals in 2007, the first year the practice became illegal, and after receiving a warning letter from the league office about discontinuing their well-known "sign stealing" operation. That much is confirmed, but there has been a whole lot of other smoke around the NFL's flagship franchise since future Hall of Fame coach Bill Belichick came to town. The new ESPN piece details New England disguising videographers as media members so that they could tape hand signals and opposing coaches without facing league punishment, and cites numerous sources within the organization that Belichick would send Patriots employees into visiting locker rooms to steal whatever they could, most notably play sheets containing the opposing teams' first 20 to 30 offensive plays. The piece also claims that the Patriots interfered with opponents' radio communications "so often that one team asked a league official to sit in the coaches' box during the game and wait for it to happen. Sure enough, on a key third down, the headset went out." Smaller claims, such as the Patriots erasing tapes of practices where they illegally used a player on injured reserve, fill out the report, and paint the picture of a franchise willing to do anything to win, no matter how minor and seemingly insignificant. It's been interesting to hear Patriots fans attempt to rationalize all these claims against their beloved team. The defenses have gone from "well, everybody else was doing it," to "look at the source man, ESPN is full of Patriots haters!" Never mind the fact that the worldwide leader is located in Connecticut (which is, uh, in New England), or the fact that whistle blowers usually have something against the person/organization they're blowing the whistle on (otherwise they wouldn't do it), Patriots fans have basically reduced themselves to the position Lance Armstrong took just before his fall from grace, constantly pointing to French doping authorities as biased, and claiming that, even if he did use performance enhancing drugs, so did all other cyclists of his era. A feeling of victimization is somewhat understandable after the league went on a ridiculous witch hunt to suspend Brady a quarter of the season for a small amount of football pressure he may, or may not, have been aware of. But let's be real, if there were this many cheating accusations from this many different sources (the ESPN report spoke with 90 sources within the league and the Patriots as well) about another franchise, Patriots fans would join in and call that team "cheaters." 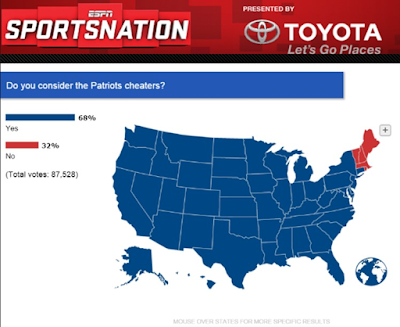 And indeed that's what we see here, as practically everybody outside of New England views the Patriots as a cheating franchise. Now, we can just say they're all "haters," or we can accept the fact that the Patriots have done an awful lot to earn that reputation. From that time they were actually caught cheating in 2007 (which Belichick admitted, sorta, by saying he "misinterpreted the rule"), to every other allegation since, the Patriots always seem to find themselves right at the edge of legality. But who really cares? 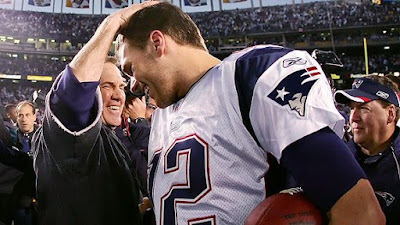 Sure, Patriots fans would love to believe that their franchise has always "won the right way," and that Golden Boy quarterback Tom Brady would never do anything wrong, but when everybody, even former Patriots employees, are saying just the opposite, you might start to question it. It never ceases to amaze me how sports fans will rationalize things like this to an almost religious degree. Steelers fans still think Ben Roethlisberger is a good guy, and don't believe any players in the 70s used steroids, or that they received favorable calls in Super Bowl XL against Seattle. Speaking of Seattle, Seahawks fans won't even admit there's a chance their defense has been aided by PEDs, despite the many suspensions Seattle defensive players have garnered for use of such drugs. The late-90s Broncos illegally manipulated the salary cap, the 49ers of the 80s shared New England's apparent affinity for knocking out opponents' headsets, and just about every other franchise has broken the rules at some point. Back to the Patriots for a moment, because these allegations have made their fan base so united and hilariously defensive, I must wonder if these same fans would care if it were proven, beyond a shadow of a doubt, that New England cheated. I have a feeling Patriots fans, and the fans of any other team, would still support their coach and team, provided they win. Look, even if the rest of the world believes the Patriots cheated, that still doesn't take away the four Super Bowl titles, six conference championships and bazillion wins over the last decade and a half. You're still going to have those memories, so why get so defensive? Heck, I'm sure fans of just about any other NFL franchise would trade places with Pats fans in a second, cheating allegations or not. So, answer me this sports fans: Do you actually care if your team cheats?